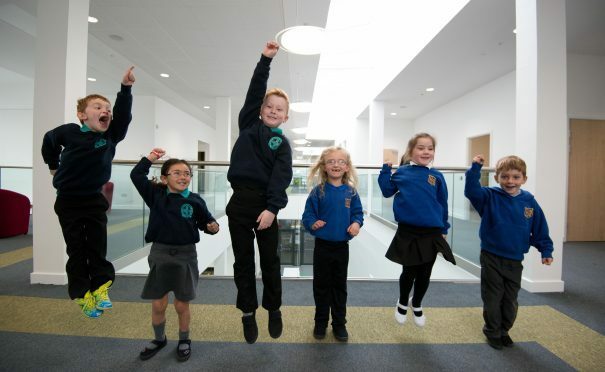 Pupils from three Lochaber primary schools yesterday moved into the new £16million Caol Joint Campus. The new building next to Caol Primary School, near Fort William, replaces the 235-pupil Caol Primary, and 110-pupil St Columba’s RC Primary School. St Columba’s pupils include former pupils from Fort William RC Primary School, also known as St Mary’s, which closed in August of last year when it amalgamated with Lochyside RC Primary School. And the youngsters can now enjoy stunning views of Ben Nevis and Loch Linnhe from their classrooms. Their former schools closed last Wednesday and pupils had an extra holiday while staff move all the equipment over to the new campus. But they were delighted to be back at school yesterday and very impressed by their new surroundings. St Columba’s head teacher Violet Smith said: “The design of the school is fantastic – so bright and spacious. “We are overwhelmed by the facilities and we are confident that the children’s learning with be greatly enhanced in such a vibrant environment. Caol Primary School head teacher Steven Hamilton described the new building as “stunning”. And he said the new school would be “a great learning environment”. The new premises, erected by Kier Construction, also include a new community centre. And the two schools share a canteen and gym hall. Councillor Thomas MacLennan, who is leader of Highland Council’s Lochaber committee, said: “It’s a fantastic new building in a lovely setting.